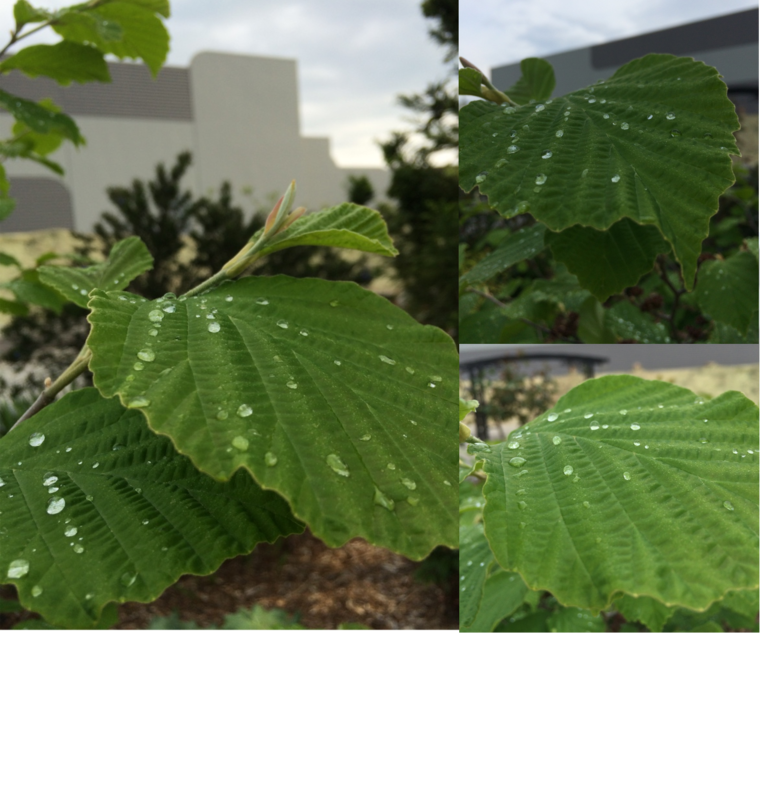 Yesterday we had a light sprinkling of rain, so I went out later with my phone to see what I could see. And I was pretty surprised at what I did see. 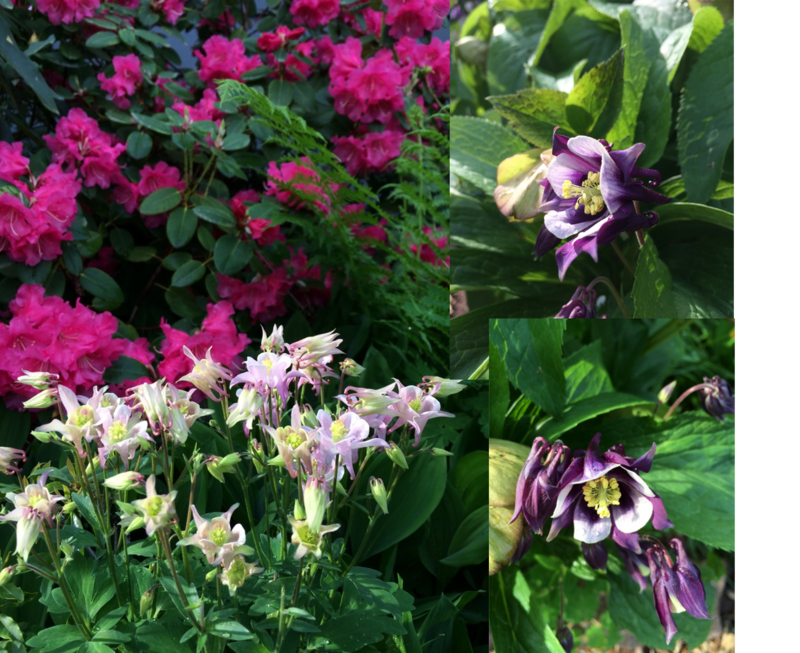 I’m always encouraging people to look at their gardens with fresh eyes, often with camera/phone in hand. And I do that myself. But when I see wonderful things, it’s always a revelation–how can the same old things look so…new? There were so many pics I’ve collected them into collages. Click on any for an enlargement. 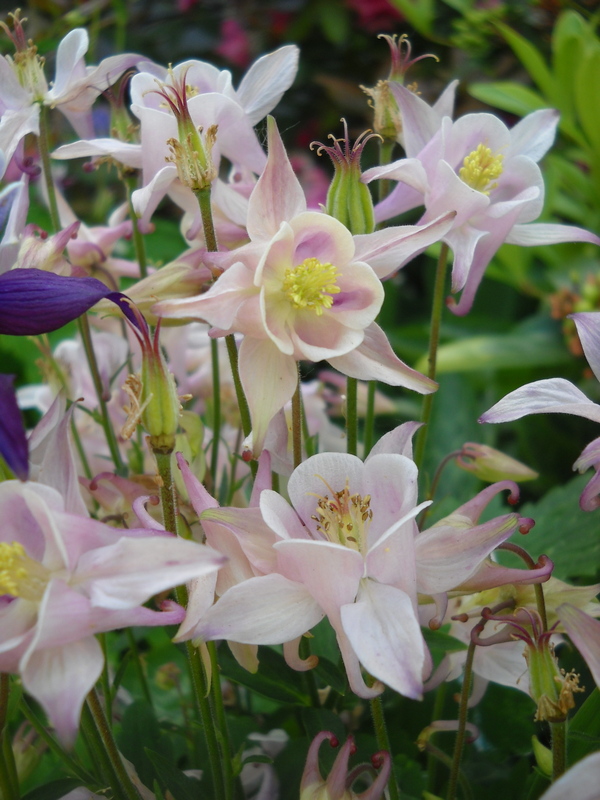 Aquilegia with subtle rhodo background. The pink blossom is about 1” diameter! 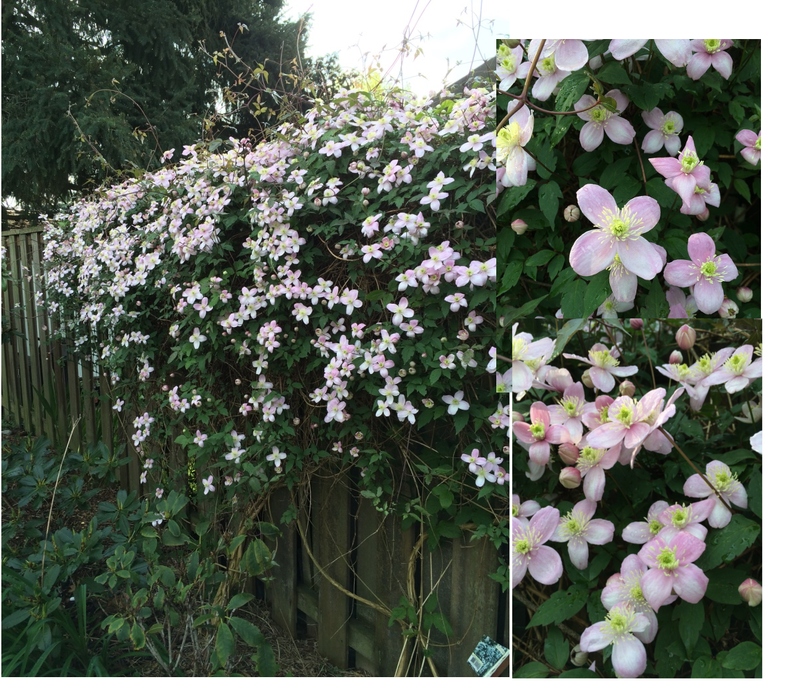 Clematis montana, possibly ‘Rubens’? (Hmmm, apparently I’ve left the label on a stick. That would be the white, possibly grandiflora, and not nearly as prolific as ‘Rubens’ .) I think it looks better every year. It’s climbing the neighbour’s shed, as well as my plum and persimmon trees. Now this is hardly believable! Is it really nature? 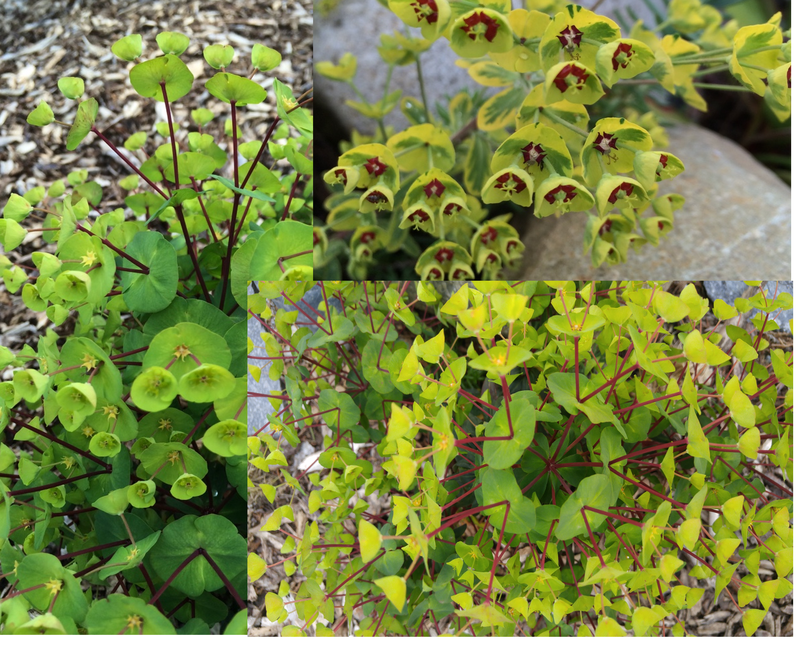 The Euphorbia with the red petioles is ‘Black Bird’, and the one with the red petals is ‘Ascot Rainbow’. 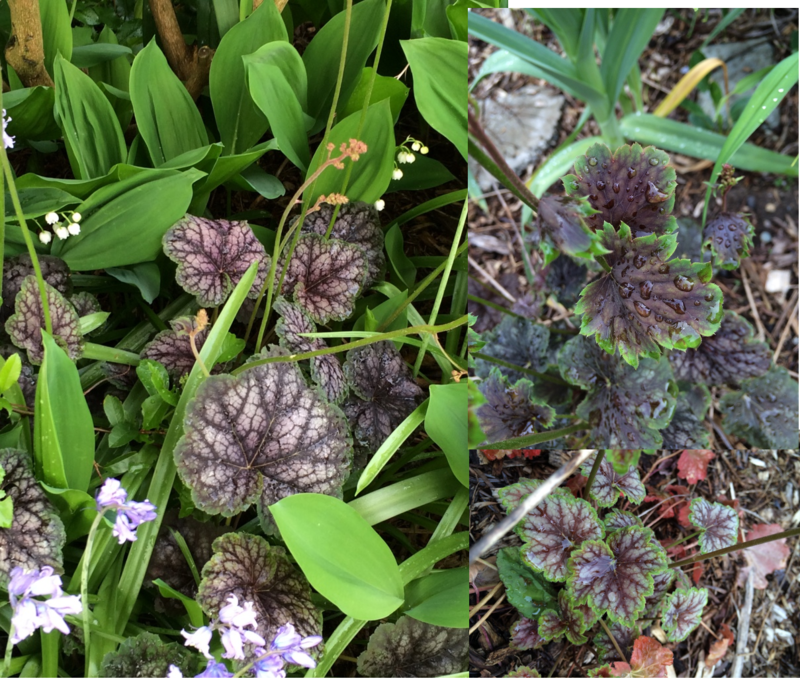 Heuchera, various cultivars that I don’t know. But definitely my favourites. 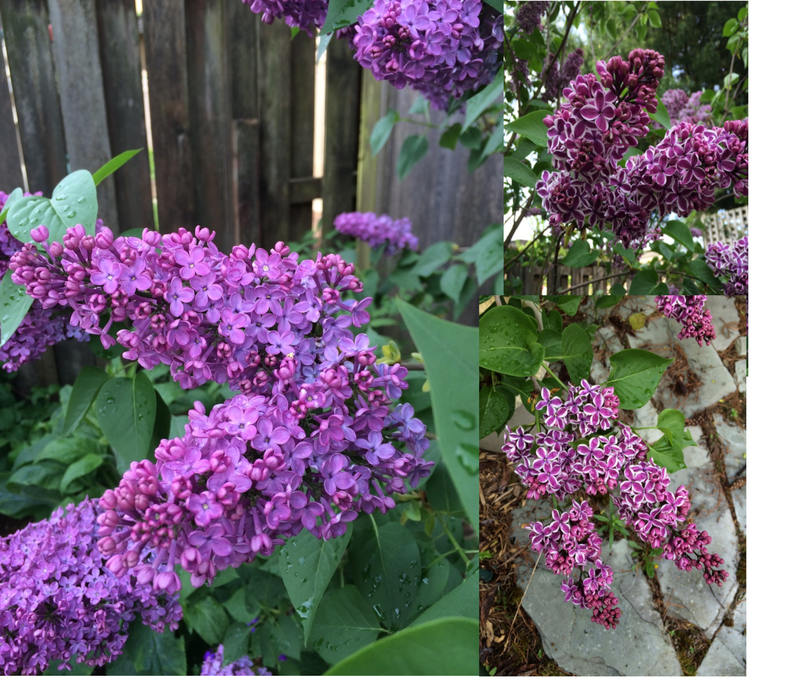 Lilac ‘Sensation’ is the one with the white edging to each floret. The other is unfortunately unnamed–a runner from a much older tree. 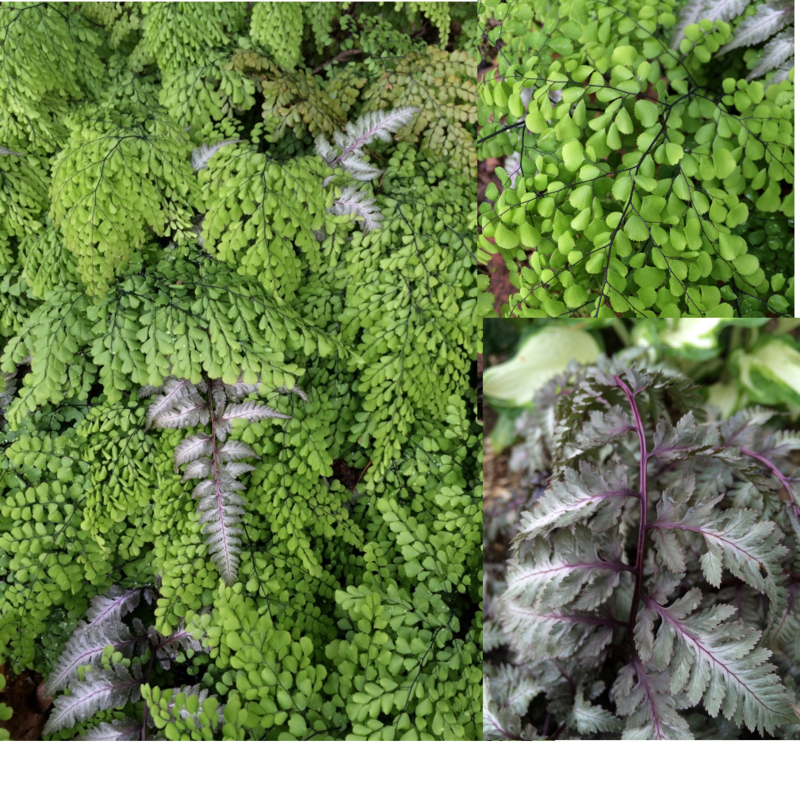 My favourite combination: Adiantum venustum and Athyrium niponicum. Amazing magenta/burgundy ribs on the athyrium, and wiry black on the Adiantum. 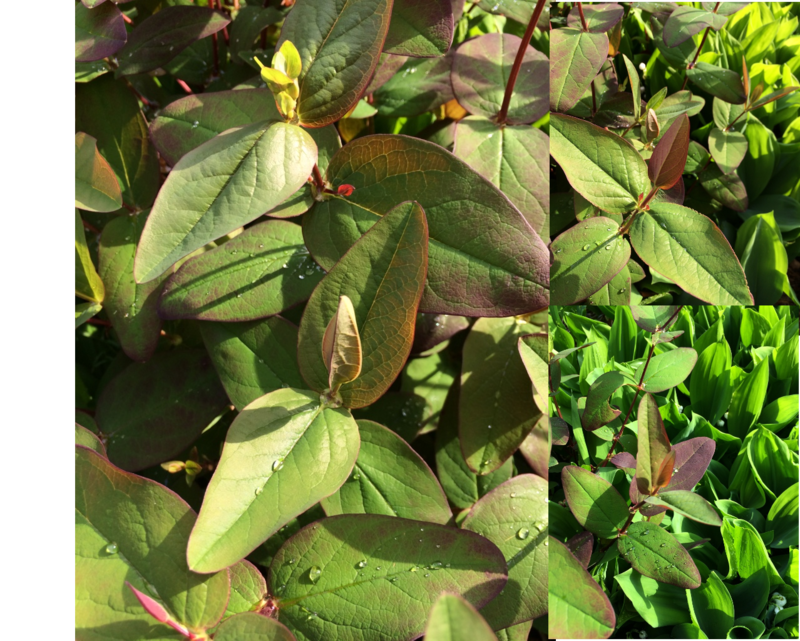 Hypericum androsaemum ‘Albury Purple’. Just look at the perfection of the new growth! 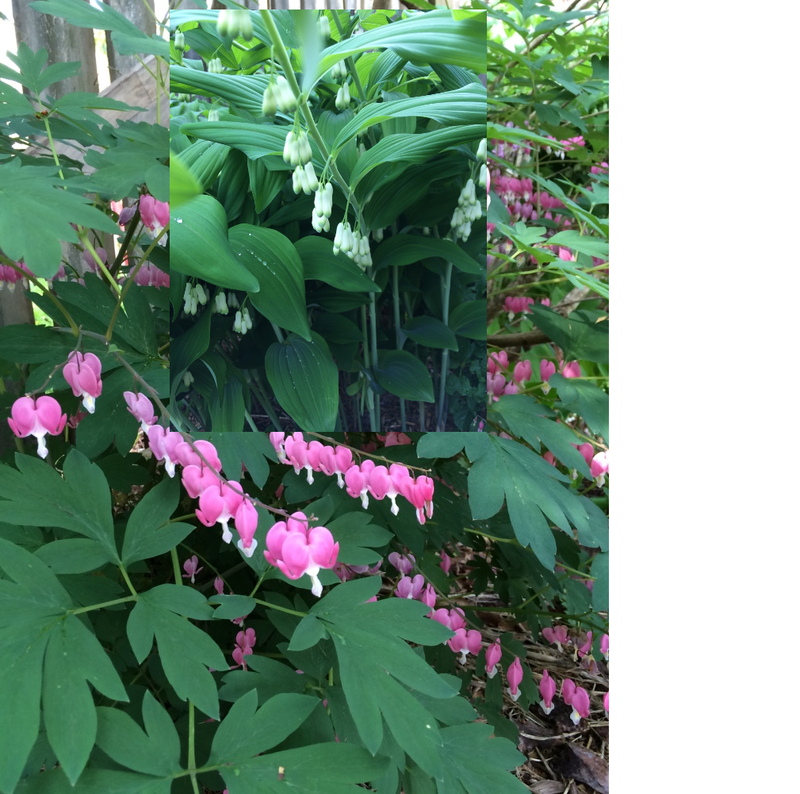 Dicentra spectabilis and polygonatum look so pretty together, despite being so similar in habit. 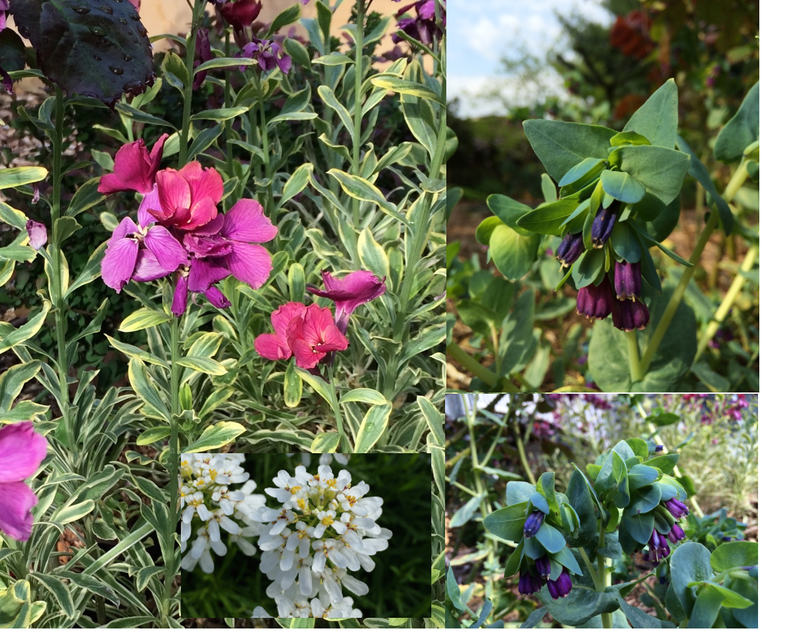 Cerinthe, Erysimum, and Iberis. All of them hard to beat. Convallaria majalis. Does it look as fragrant in the picture as in person? Yes, it’s terribly aggressive, but it doesn’t really harm anything else around it, so I just keep digging holes and planting among the waves. 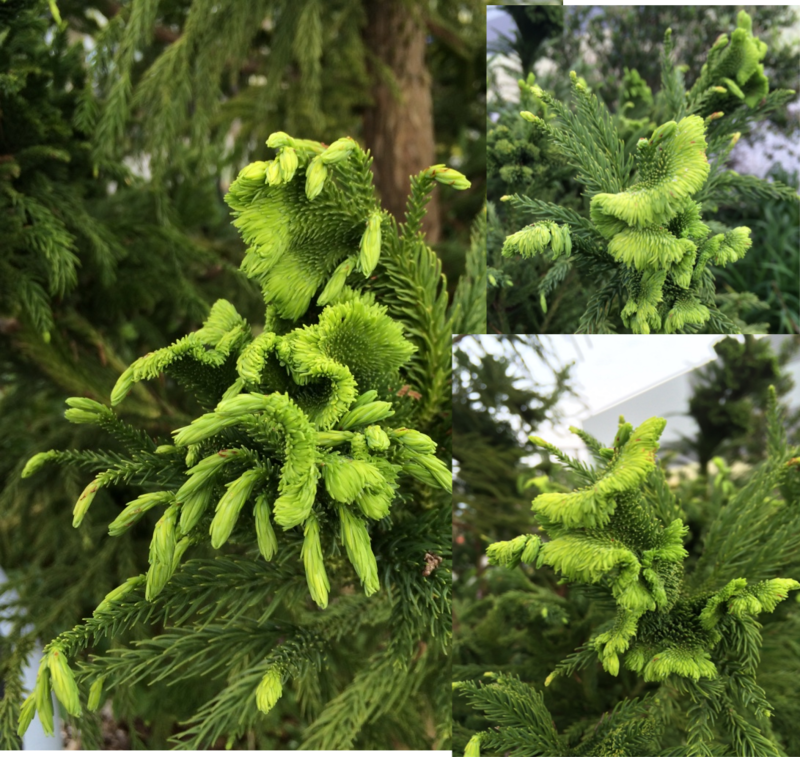 So You Bought a Shrub, Now What? It occurs to me that people may be a little unclear about what to do with that cute little plant you just bought/received/acquired. I mean, how hard can it be? 1. Buy. 2. Take out of pot. 3. Put in the ground. 4. Watch it grow. Well, the answer is, pretty much not hard at all. As long as you’re aware of a few things. As with all living things, the plants you plant in your garden need three things: water, air and food. Plants that are container grown start as a seed or cutting, or in many cases nowadays, tissue cultures. Once they get to a certain size, they are transplanted into a larger pot that is suitable for sale. The plant company may then decide to grow the plant, then transplant it again into a larger pot so that it can be sold for more money. Say the difference between a 4 in. pot selling for $4 and a 6 in. pot–a 1-gallon container–selling for $15. It would probably take the best part of a year to get from the seed or cutting or tissue culture stage to a 1-gallon container pot stage. Now suppose the plant company put that 1-gallon container plant out the day after it was transplanted from the 4″ pot. It would still be a $4 plant now selling for $15. You can tell that by looking at the roots. Can’t see the roots through the solid pot? (What, don’t you have x-ray vision?) So you carefully tip the plant out of the container to see what the quality of the roots are. If you’re a little squeamish about doing that at the garden centre (or Home Depot), you can get a sales staff to do it for you. (And if they won’t, DON’T BUY THE PLANT!) If you don’t see any roots at the edges of the soil, you are paying a 1-gallon price for a 4″ plant. But on the other hand, suppose the plant company didn’t deliver all its 1-gallon plants this year, and they have to hold on to them until next year. Now you’ve got nice healthy plants growing in a small cramped environment. 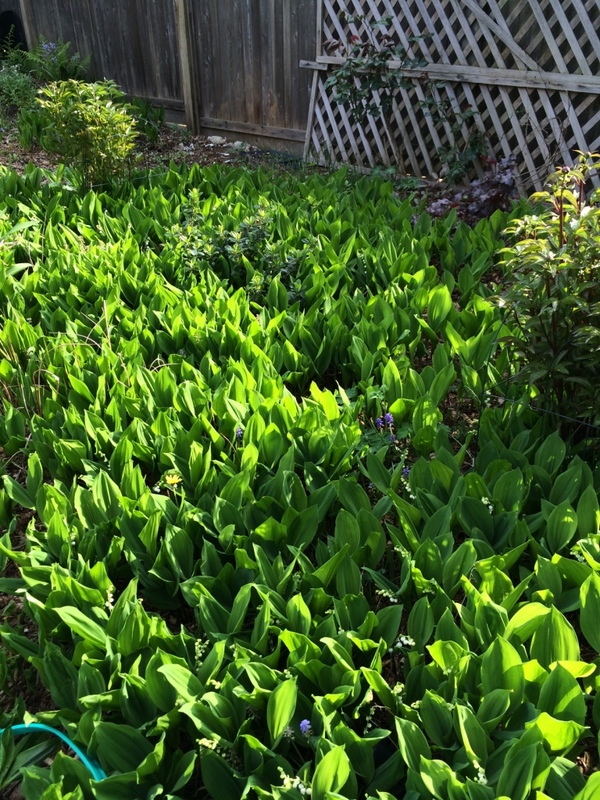 For a while the plant will be fine, but time will come when it’s beginning to use up the available space. Now it’s going to dry out faster, and the roots will run into the edge of the pot, and start to travel around the outside. So when you check out the roots, if you see them travelling around the edge of the pot, DON’T BUY IT. If it’s the only one there, and you really want it, show the sales staff what you’ve found and make sure you get a discount. (That’s frugal Janet talking!) And when you’re about to plant it, cut through the roots in quarters along the length of the root ball. 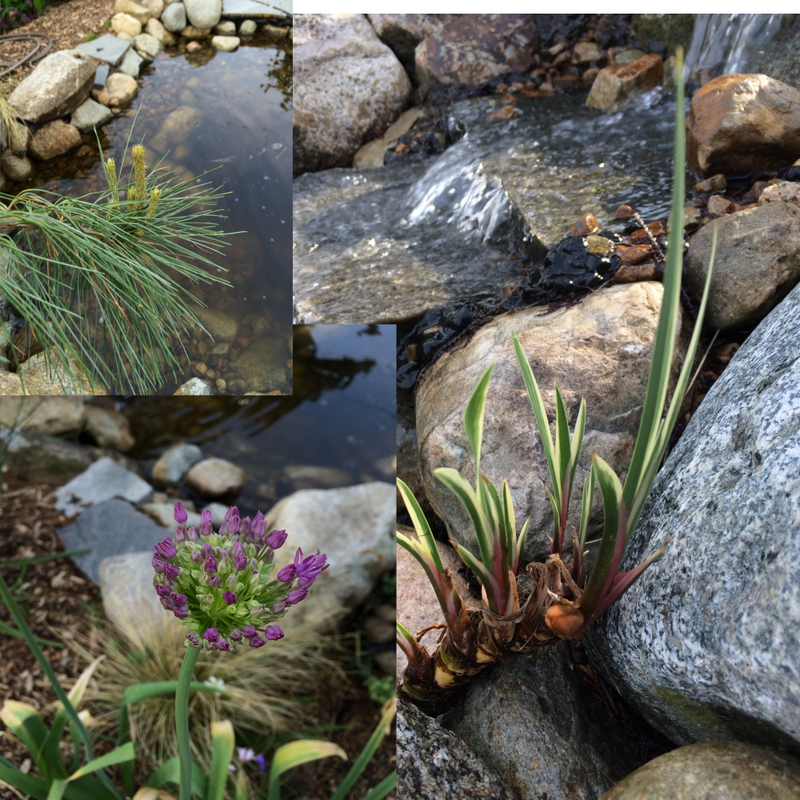 Thanks to Henny Penny Rose Cottage for this great pic of root bound plant! If you plant the plant like you’ve received it, the roots will continue to grow in the direction they’ve started and will never support healthy growth. It’ll die. 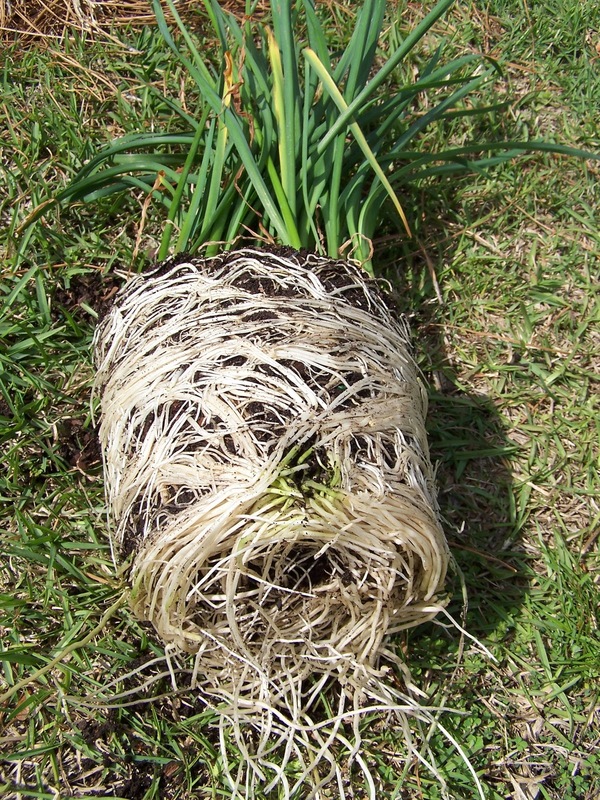 As I often do, here’s a link from Linda Chalker-Scott about plants that are root-bound in their pots. LCS would recommend you actually wash the rootball. I haven’t tried that–I should try it in my research garden! 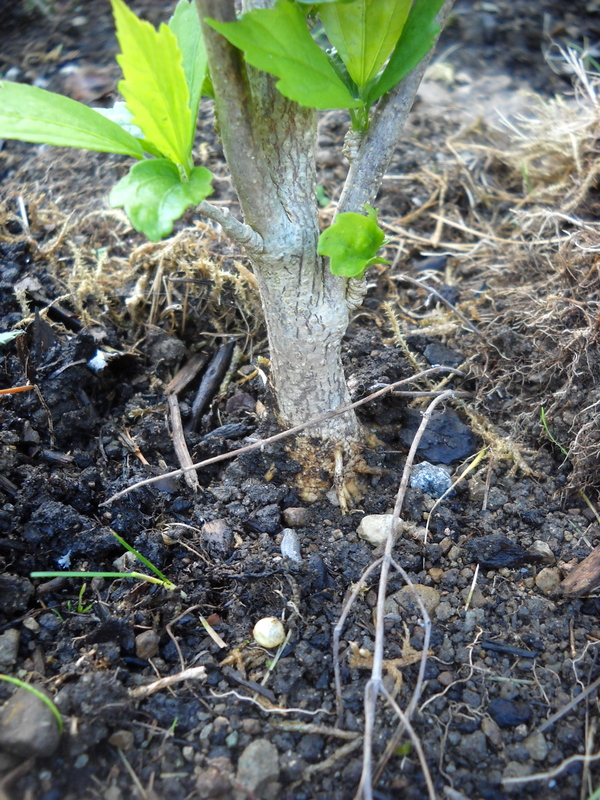 Hardy Hibiscus (Hibiscus syriacus) planted high–you can see roots at the base going into the soil. Most plants should be planted at the same level that you find them in their pots. You take it out of the container, put it into a hole that is dug just about the same depth as the rootball, and then backfill the space with the soil you dug out. Definitely trees and shrubs should be planted this way, some perennials can go deeper, and roses can go as deep as you like. (In Ontario I’ve heard recommendations to plant roses 6″ deeper that you find them in their pots.) You’re going to dig only as deep as the rootball, but much wider than the rootball. This way there is lots of loose soil for the roots to travel sideways. And the soil is the same as you dug out, so there’s no “soil interface” problems. That’s when the soil your plants have been living in and the soil you’re planting into are so different the water doesn’t travel from one to the other. Adding compost or manure or something else to the backfill soil (“amending the soil”) will cause a “soil interface” problem. Now you can certainly “top-dress” the plant–a couple inches of compost on top of the soil, away from the stem/crown/trunk of the plant–and the earthworms will work it into the soil. A couple honourable mentions: Rhodos root very superficially, so you can safely allow the rootball to sit a little higher in the ground than the grade around. And tomatoes should be planted deeper that in the pot–cut the bottom leaves off, with only 4-8 leaves remaining at the tip, and then plant deep enough so that the whole bare stem is covered. The stem will root all along it’s length giving you a great root system. Water your plant a lot. If you’re planting now, it’ll be drying out pretty soon, and your plant will need lots of additional water that you will have to supply. On the other hand, if you don’t buy that plant you want so much until the fall, the cool weather will be easier on the plant, the lack of freezing will allow it to grow roots before it gets too cold, and the rains will do the work of watering so you won’t have to. In coastal BC planting in the fall is the best, and we can do it pretty much up until Christmas! If it’s an “herbaceous perennial”–which means it will die down over the winter and grow again in the spring–make sure you mark where it is so you don’t walk over it, dig it up by mistake, or try to plant bulbs there. 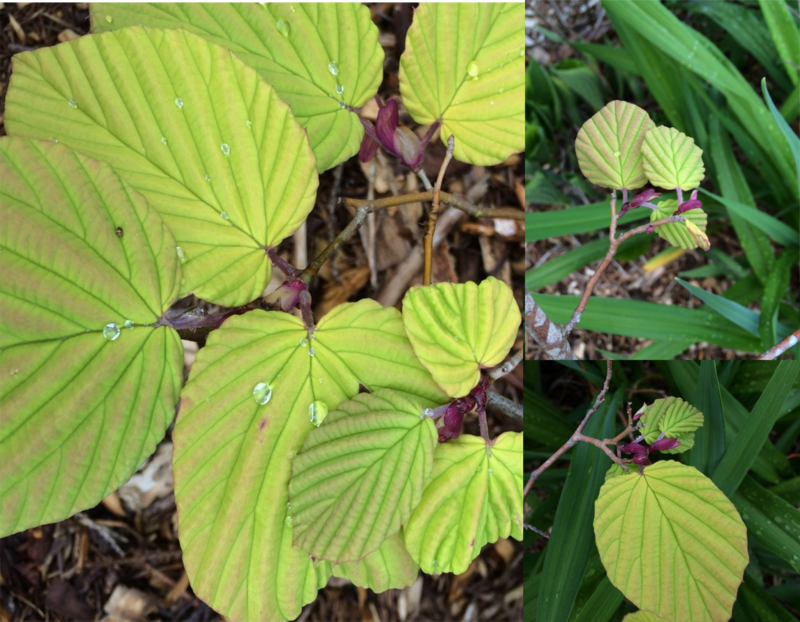 I enjoy reading Doug Green’s Garden posts, and today on FB he steals my thunder. As always, please comment, questions, refute (nicely), share, or otherwise leave feedback. 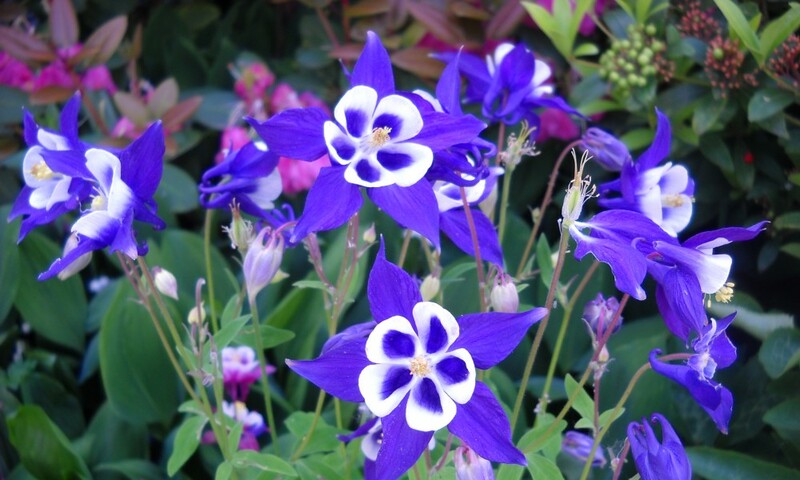 Unrelated picture of Aquilegia–Columbine. Very shade tolerant!